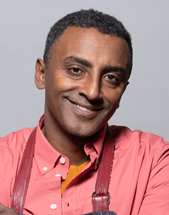 Marcus Samuelsson is the acclaimed chef behind Red Rooster Harlem, Ginny’s Supper Club, Marcus at the Hamilton Princess & Beach Club in Bermuda, Norda Bar & Grill in Gothenburg, Sweden, and in 2017, Red Rooster Shoreditch in London and Marcus B&P in Newark. He has thrilled the food scene with a blend of culture and artistic excellence, first catching the attention of the culinary world at Aquavit. During his tenure as executive chef there, he received an impressive three-star rating from The New York Times, the youngest person ever to receive such an accolade. Samuelsson is the author of several cookbooks, including the James Beard Award-winning The Soul of a New Cuisine, Marcus Off Duty: The Recipes I Cook at Home and The Red Rooster Cookbook (October 2016). In addition to being a successful cookbook author, in 2012 he released his New York Times best-seller and James Beard-winning memoir Yes, Chef to rave reviews and his young adult book, Make It Messy. Samuelsson was the winner on Bravo’s “Top Chef Masters” Season Two as well as the second season of “Chopped All-Stars.” He serves as a recurring judge for “Chopped,” one of Food Network’s highest-rated series with a following of over 20 million viewers a month, and he was a mentor on ABC’s “The Taste,” guiding a team of new culinary talent through a series of challenges. In 2009, Samuelsson was selected as a guest chef at the White House under the Obama Administration, where he planned and executed the administration’s first state dinner honoring Prime Minister Singh of India. He has several philanthropic projects and serves as a UNICEF Ambassador, a member of the U.S. State Department’s Chef Corps and as the co-chairman for the organization Careers Through Culinary Arts Program, which works with public schools across the country to prepare underserved high school students for college and career opportunities in the restaurant and hospitality industry. In 2016, Samuelsson was inducted into the James Beard Foundation Who’s Who of Food and Beverage in America. He is co-founder and co-produces Harlem EatUp!, an annual food and culture festival in Harlem, which will celebrate its fourth anniversary in 2018. As an international patron of the arts, Samuelsson is honored to be a board member for both The Apollo Theater and The Museum of Modern Art. Hosted by renowned chef Marcus Samuelsson, NO PASSPORT REQUIRED is a new six-part PBS/Eater series that takes viewers on an inspiring journey across the U.S. to explore and celebrate the wide-ranging diversity of immigrant traditions and cuisine woven into American food and culture. Each week Marcus — an immigrant himself — visits a new city to discover the dynamic and creative ways a particular community has made its mark. A vibrant portrait of America today, NO PASSPORT REQUIRED features musicians, poets, chefs, business owners, artists, community leaders and home cooks who have enhanced the nation’s culture and cuisine. Tune in or stream on July 10 at 9/8c. Check local listings.